The Commissioner of Police of the Metropolis and representatives of the de Menezes family are pleased to announce that all litigation between them arising out of the tragic death of Jean Charles de Menezes has been resolved. The members of the family are pleased that a compensation package has been agreed which enables them to put these events behind them and move forward with their lives. In view of the physical and mental distress caused to the members of the family by these events and the understandable publicity and press interest, it has been agreed that it is in the best interests of the family that no further statement in relation to this settlement will be made either by them or the Commissioner. The Commissioner would like to take this opportunity of making a further unreserved apology to the family for the tragic death of Jean Charles de Menezes and to reiterate that he was a totally innocent victim and in no way to blame for his untimely death. It has taken four years, four months and one day for the de Menezes to reach some closure in its fight for justice. The inquest showed 'there is a real risk, then, it could happen again'. 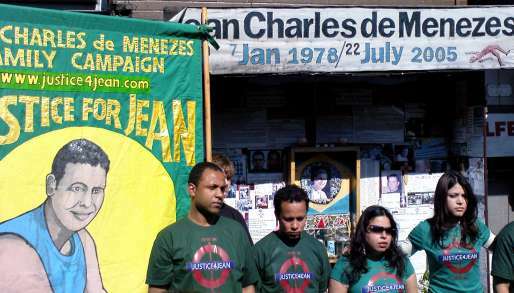 Responding to the IPCC's decision not to discipline any officer involved in the operation that led to the shooting of Jean Charles de Menezes, one of his cousin commented: 'Our family and the British public have been completely failed by this decision, we all live under the terror that the same thing could happen again. Nobody should accept this.' Keeping this story alive remains important.